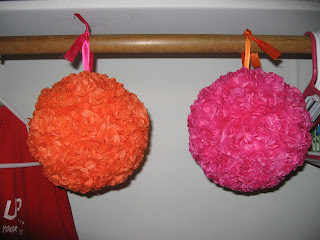 The DIY Bride: Tissue Paper Pomanders - Check! Starting these pomanders was my first DIY project that I ever started for the wedding. I decided to start on them about a year out because I knew they would be time consuming. I've since removed all the flowers from the balls because I've decided that actually fanning out the flowers so far in advance doesn't make the pomanders look as good as they should. In my case, we had to move them around a lot so flowers kept getting smashed. So I've been making the flowers, but I haven't been fanning them out. I plan to fan them out about one week prior to the wedding to have them looking their best. I'll be posting my directions next on how to make these! I just stumbled across your blog, I am also a DIY bride and we are getting married in October of this year. You have some super cute ideas that are SO unique! These are adorable!!!! I will definitely be reading your whole blog!